Entrepreneur, public speaker, and philanthropist, Aalap Shah, is co-founder of SoMe Connect, a rapidly growing social media and digital content marketing boutique based in Chicago, IL. Since founding the company in 2011, some of the clients that Aalap and his team have worked with include Yum!,, Orbitz, TransUnion, Potbelly’s, and Inc. Magazine. Speaking at 100+ events in the last three years, Aalap can often be found sharing his experience and passion for creative content development, digital marketing strategy, and startups at events such as NBEA, Clickz, Social Media Week, Media Post, and Bloggers Week Summit. 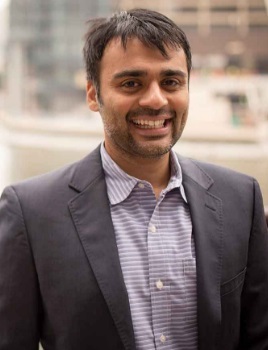 A husband and father of two, Aalap has also dedicated his life to philanthropy – serving as an e-council member for the Network For Teaching Entrepreneurship, a board member for the Illinois Mathematics Science Academy, a board member for Good City, and a volunteer for Teach For America. In 2013, he was recognized as a “Chicago Crain’s Emerging Young Philanthropist” and as “National Volunteer of the Year” by Network For Teaching Entrepreneurship. I started out as a CPA working with Deloitte. In 2011, I met my business partner and we started talking about the opportunity in digital development and marketing. We started SoMe Connect and have since been very successful at attracting and retaining big clients with specific goals including Potbelly’s, Hammacher Schlemmer, Ocean Tomo, AHA (American Hospital Association), Byram Healthcare, and Sweep Home Chicago. We see more influencers – in every stage of the funnel – using online searches to inform their decisions. Many industries are consolidating. Healthcare is a good example of both of these trends occurring. As more doctors’ practices get rolled into big hospital and healthcare conglomerates, we are not just targeting doctors but purchasers and executives too. Audiences are changing and the way they consume information is changing too. We are now looking at mobile solutions more than we ever have. There are many people that learned how to build websites. Then, many people who learned how to do great SEO. And then, even more people who know how to tell a story. However, there are not many people or companies that know how to do everything. It’s becoming more important to be multi-disciplined in our approach to online marketing. First, I want people to like working with us – employees and clients alike. I believe that people who feel good about their team, who see each other as valuable partners, in general, do better work. They also are better clients. So, we learn and adapt and stay sharp but we also want to be fun to work with and very responsive. There is a lot of heart and soul in our work, and it’s definitely part of our vision for the business. We are watching the movement in social and anticipating challenges marketers will face when different platforms emerge and recede from the spotlight. We do a lot of targeted online advertising, search engine optimization, and website development. While those skills aren’t necessarily new – how we apply them is. We are getting more specific asks. For example, Potbelly was looking for increased awareness of its specialty sandwiches in a specific market. We leveraged their loyal following to measurably expand its footprint. Similarly, Byram Healthcare approached us to educate members about their breast pump ordering service. I think marketers are looking to online marketing to solve more specific problems, and we are really good at understanding how to build a solution that meets a specific need. I’ve also talked about how e-commerce is changing in this recent CIO article. I will always believe in putting relationships first. The business changes, the market changes, workplace norms change, but I believe people will always respond well when there’s a lot of respect on the table. Our core values address how people relate to us and how we serve our clients. I think a byproduct of that position is our employees care about doing a good job and feel like they are part of our momentum, so we’re successful because we all play well together and do good work. For me, the most difficult part of the business was failure after failure until I learned I had to be either all in or all out. I threw myself all in and haven’t looked back. I spoke at a Glappinova panel about this, it was such an impactful lesson. It was a tough personal challenge, one I think a lot of multi-entrepreneurs struggle with, especially at the beginning. As I mentioned before, we work best with larger clients that have a specific problem they want to solve. We play well with other agencies and internal marketing teams, so we can slide into a situation, tinker, and then solve a problem that otherwise would’ve been an obstacle internally or within a bigger team. A good example is Vantaggio HR. Great service, great portfolio of existing clients – they wanted to prepare themselves to succeed online by building an effective lead generation plan. None of them were really marketers, so we came in as a valued partner. We are still working with them today because there hasn’t been a reason to go anywhere else. I think offering employees a place to innovate and getting out of their way is a great way to stoke that fire that is already burning in smart people. When someone is really good at something and feels good about their role, they want to do good work. For me, it’s not so much about creating motivation, it’s more about fanning that flame that already exists. Then, the right people stay and thrive. Yeats (by way of paraphrasing Socrates) said, “Education is not the filling of a pail, but the lighting of a fire.” And that’s true about anything worth doing. Employment for inbound marketing managers is on the upswing and is supposed to grow by more than 13 percent by 2020. It’s simple supply and demand. The field is growing faster than any other marketing and communications discipline. The real issue is a widening skills gap. As the market gets bigger, finding the right employee gets harder. There’s real pressure on candidates to be both specialized but also knowledgeable of many different skills. So, my advice is become that person. Know how everything fits together, be confident in your ability to diagnose a problem. Look outside the box. Work with many different clients and get your hands into a lot of different case studies. Learn how to both strategize and coordinate projects.